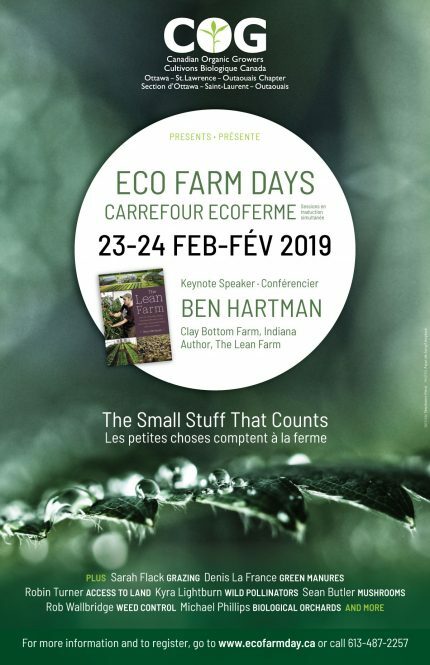 Canadian Organic Growers Ottawa – St Lawrence – Outaouais Chapter (COG OSO) is bringing Eco Farm Days back to Cornwall this February 23 and 24, 2019, at the Cornwall Ramada Inn and Conference Centre. This year’s Keynote presenter is Ben Hartman of Clay Bottom Farm in Indiana, and author of The LEAN Farm. Along with the Keynote address, there will also be an exhibitor trade show, organic lunch, and a dozen workshops relating to plants, livestock, soils and more. For more information, visit www.ecofarmday.ca.